In this activity I try to show how we can have fun using coding to hack or play with a famous painting. Specifically, I used Scratch to do some playful coding with the painting "The pilgrim", by René Magritte. Magritte is an artist that children like very much (like all surrealists) because of his ability to unsettle you and make you wonder what you're seeing. The programming in my project is very simple. It allows to move the head of "The pilgrim" with the arrow keys and make it coincide with the body (in the painting they are separate). You can also change the head and make others appear: the same face covered by an apple (a reference to another painting by Magritte), the Scratch cat, or Picasso's face. In this project we are exploring two of the many things we can perform on a painting through creative computing: (1) to make an object in the painting move, and (2) to make appear new objects that were not in the painting. Even if we use images of artworks for educational purposes, it is very important that we always cite the works and the authors. To move an object in the painting, first we have to turn it into a "sprite". This means that we have to cut it out from the image, and fill the remaining space so that the cut is not noticeable (content-aware fill). In the image below you can see the original painting, the version without the face, and the face. Although cutting images with the Scratch drawing editor is feasible, if we want to do a precise work, then it is not recommended. To do this kind of tasks we can use free and open source software like Gimp. There are also online editors like Pixlr. Gimp has a plugin called "Resynthesizer" that allows you to select something you want to remove from an image, and with the push of a key, it's gone without a trace. When you have completed these steps, programming with Scratch is very easy. Simply put the painting without the face as a background (or as a sprite in the back layer) and then add a sprite that is the face you have saved in a separate file. From then on you can move the face, modify it, add sounds, or anything else you can think of. I've added some buttons to the project that allow you to change the face. I do it through "costumes". The same sprite has several costumes with other images that I have added. Check the project and the scripts here, and feel free to remix it. There are many ways to reimagine this activity. Take a look at other Magritte's paintings, you will see that they are very thought-provoking and will give you a lot of ideas. Let the children explore them. Also think about how to add interactivity with the physical world. 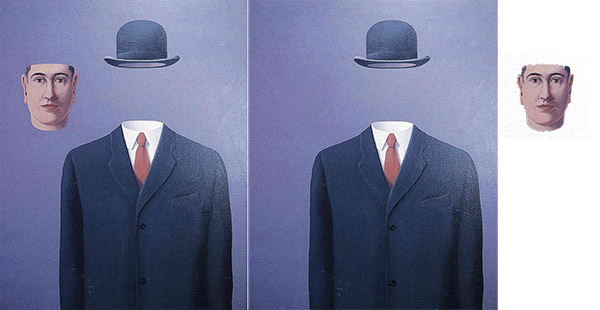 For example, there are some objects that appear recurrently in Magritte's paintings (hats, apples, pipes, umbrellas). You can play with real objects and the Makey-Makey kit to make them appear or disappear from the paintings on the screen.